The PlayStation Vita may not be the on-the-go PS3 that it was first thought to be and, although it has beefy specs in its own right, it still can’t match the power of a home console. But the PlayStation Vita is capable of connecting with the PS3 in unique ways that, in a sense, do give you a PlayStation 3 in the palm of your hands, wherever you go. Remote play was a nifty feature added to Sony’s first portable, the PSP. Unfortunately, the feature only worked with a handful of PSN games and, even then, it didn’t work very well. The PlayStation Vita, on the other hand, is far more capable than the PSP, and has been shown to work with Killzone 3 – one of the PlayStation 3’s most technically impressive games. Killzone 3 is the only PS3 title confirmed to work with the Vita via remote play, but if it’s possible with such a resource taxing game, then you can be sure it will work with many, many others. There were rumors circulating that remote play would be possible with all PS3 games, but that was quickly shot down by a rep for Sony. That was a little far-fetched, anyway. But remote play isn’t the only way that the Vita will connect with the PS3. WipEout 2048 players on the PlayStation Vita can compete against WipEout HD players on the PS3 online. It works extremely well, too. Another instance of PS3 connectivity is with the game Ruin (something similar will be done with Kojima Productions titles thanks to “transfarring”) where the PS3 version can be saved and the save data transferred to the Vita, letting you pick up and play where you left off. That way, you never have to be without your favorite game. The PSP was home to some of the greatest RPGs of the past decade, and that trend will likely continue on the Vita. RPGs could put this save transfer feature to best use. Imagine taking on epic boss fights while at home, but getting the grinding out of the way while on the subway. The PlayStation Vita is already being pegged as the “ultimate” PS3 controller by Ultimate Marvel Vs. Capcom 3. Because it has dual analog sticks and all of the PS3’s face buttons, it can not only duplicate the controller experience, but add to it as well with extra touch control features. 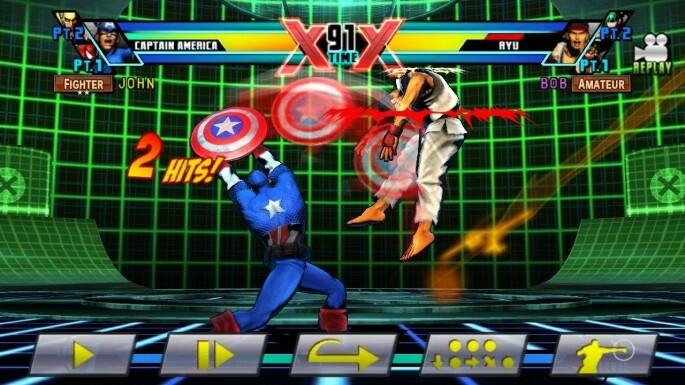 In UMvC3 for the Vita, you can use the handheld’s touch interface to more easily perform super moves and other attacks. This is normally not possible on the PlayStation 3, but when using the Vita as the PlayStation 3 controller it is. It’s also interesting to note that even at the PlayStation Vita’s launch it has the superior version of UMvC3 over the PlayStation 3. All of these connectivity options between the PlayStation Vita and the PS3 will be available at launch, or shortly after. Seeing all that is possible this early on in the PlayStation Vita’s life (which hasn’t even officially started yet), proves that the future of interactions between Sony’s two flagship systems is extremely promising. If Sony can properly exploit and market these features, the PlayStation Vita is instantly attractive to anyone owning a PlayStation 3. In a way, the PlayStation 3 could be PlayStation Vita’s killer app.